The sternum is the flat bone located in the middle of the chest (also called the breastbone). The upper part of the sternum supports the collarbone (clavicle), and the cartilage of your first seven ribs is attached to the margins of your breastbone. Your sternum has parts (the body, the manubrium, and the xiphoid process) and acts as a shield protecting the vital organs of your chest cavity—the lungs, the heart—and blood vessels. 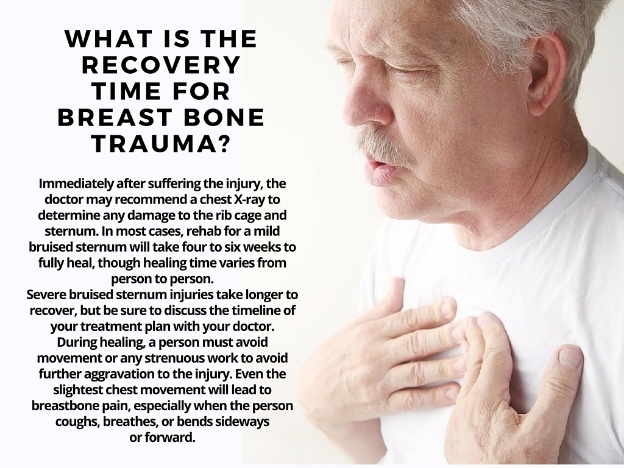 So what happens when it gets hurt?A bruised sternum or a cracked sternum (1) is often the result of a forceful impact to the breastbone, usually caused by something like a car accident. This is also called a sternum contusion. What Are the Causes of a Bruised Sternum? Bruised skin around the breastbone. A bruised sternum can result from car accidents in which the drivers fail to wear seat belts, because the chest and thorax will slam directly into the steering wheel. The impact can be so severe that it will not only bruise the sternum, but also injure internal organs or break bones. But that said, wearing a seatbelt can also lead to a bruised sternum, as the force of the seatbelt preventing you from moving forward can lead to bruising. Saving your life is, of course, worth some bruising and discomfort. A hacking or whooping cough can be so violent that it can bruise the sternum. 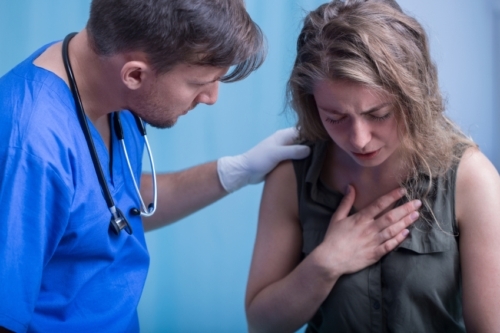 The forceful nature of the coughing puts pressure on the chest plate, and if the coughing continues for a long time, the sternum can eventually bruise. Certain sports are violent by nature, including boxing, rugby, hockey, and football. The impact experienced in these sports increases the risk of bruising around the body, and a bruised sternum can be especially common when protective gear isn’t worn. In severe cases of a bruised sternum, your doctor may recommend non-steroidal anti-inflammatory drugs (NSAIDs) such as aspirin or ibuprofen. NSAIDs will help reduce swelling and pain associated with your breastbone injury. Your doctor may also suggest micro-current therapy to reduce pain and to repair damaged tissues. Micro-current therapy exposes the breastbone to a small electrical current. It’s a good idea to rub a cold compress along your bruised sternum for five to 10 minutes, three times daily to help reduce swelling and pain. Ice should never be applied directly to the skin. Wrap the ice in a piece of cloth to create a cold compress. A nutrient-rich diet is necessary to help promote faster bone healing. Vitamin C is important to reduce inflammation, while vitamin K can help heal bone bruises through the regulation of blood clotting. Foods high in both nutrients include parsley, broccoli, cauliflower, and romaine lettuce. Leafy greens in general will promote bone density. Fruit high in vitamin C includes lemon juice, strawberries, and cantaloupe. There are also certain foods that should be avoided to help your bruised breastbone heal. It’s best to eliminate processed foods from the diet, including refined grains, carbonated drinks such as sodas, and foods high in sugar. Processed sugar will promote inflammation and make it harder for your bones to heal, and the high salt in many processed foods is also linked with bone loss. Alcohol and caffeine may also contribute to bone loss. What is the proper protocol when working out with a bruised sternum? Exercise with a bruised sternum can be performed once your symptoms begin to subside. At this time, exercise should be low-impact and non-weight-bearing, such as swimming, walking, or biking. This should reduce any stiffness associated with your injury. Homeopathic remedies can also help for sternum bruises caused by an injury. Arnica montana is often the first remedy used for a bruised sternum after the initial shock from a car accident or sports injury. Aconite can then be given for the fear from the bruise. Other effective remedies for a bruised sternum include ledum, rhus toxicodendron, bellis, calendula, and symphytum. There are several nutrients that support bone health, including calcium and magnesium. For starters, bone is primarily made of calcium phosphate. Magnesium is then required for the proper metabolism of calcium through vitamin D activation and parathyroid hormone production. There are also studies which show that essential fatty acids improve calcium absorption. Other nutrients important for bone health include zinc, manganese, strontium, and silicon. Bromelain is an enzyme with natural anti-inflammatory properties that can help reduce swelling from a bruised sternum. Though it’s commonly found in papaya and pineapple, bromelain is considered far more effective in supplement form. The recommended dosage is 500 to 2,000 milligrams of bromelain twice daily between meals to help reduce inflammation. Boron is another great mineral for bone health, as it works in combination with calcium to build bones. It’s also necessary to help fight blood clotting when the body is healing from bruises. Boron is also known to activate vitamin D3, which is another important nutrient for bone health. It’s recommended to take three to five milligrams daily to help heal from bone bruises. Other natural remedies that can reduce the inflammation from a breastbone bruise include lysine, frankincense, comfrey, bilberry, arnica oil, and calendula. Smoking or secondhand smoke can weaken bones and decrease the rate of bone healing. Quitting smoking may be hard, but it’s also a solid preventative strategy in reducing the severity of a breastbone injury. Everyone is different, so we all heal at different speeds. It’s important to take time to heal and get plenty of rest. Athletes in particular should not return to playing before being properly cleared by a medical professional. Natural remedies can certainly speed up the healing process, including homeopathy, calcium and magnesium, and bromelain.